This Christmas Tree Sun Catcher craft has been something we've been thinking about for a while. With the sun streaming in through the dining room window, it's the perfect place for sun catchers. And this Christmas themed sun catcher is the perfect addition to our big dining room window. We went a little crazy with the sequins on this craft. Our Christmas tree sun catcher is very sparkly, and just right for the season! Big Sister loved making this project and the fine motor work involved was just right for her age. This craft started with some major Sequins , and two triangles cut from green Construction Paper . How pretty are these sequins?? LOVE the colors and sparkles in this Christmas craft! I cut two triangles of Clear Contact Paper , just slightly smaller than the green triangles. Big Sister started placing the sequins on the contact paper. This was such a great fine motor activity for that Neat Pincer Grasp. 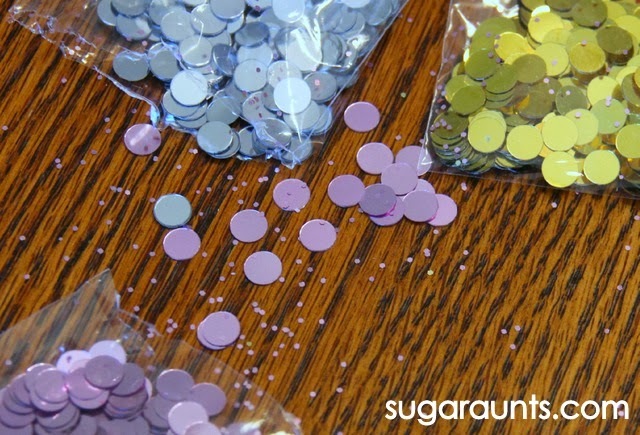 To pick up the sequins from the table surface and place them onto the contact paper requires tip to tip grasp of the index finger and thumb. All of those sequins was a great workout! She did a ton of them, but we ended up sprinkling even more sequins on to the contact paper to give our sun catcher a REALLY sparkly look. Next came Big Sister's favorite part. Do all Kindergarteners love tape as much as she does? This girl loooooooves tape! We stuck the two pieces of contact paper together to sandwich the sequins in the middle. Then we taped the contact paper onto on of the green triangles. A little glue held the top triangle in place and our sun catcher was complete! Let us know if you do this craft. We love to see our projects come to life with your kids! Shoot us an email at sugaraunts@gmail.com or post a picture on our FB wall if you do this one. Happy crafting!